Back with another tutorial/review/giveaway! Today's look was inspired from Lady Gaga's gorgeous makeup at this year's Grammys. The look was bold yet glamorous and kudos to Celebrity Makeup Artist Billy B for finally making celebrity makeup tutorials fun to do! As soon as I saw Gaga's look, I knew I wanted to recreate it. I did this look right after the awards but wanted to wait till today to make sure I posted it with my Sigma Makeup Friday Giveaways. 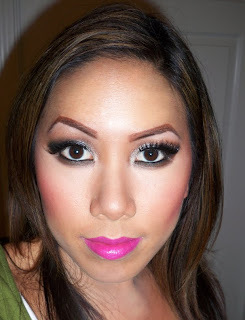 The look is pretty much a smokey eye and hot pink lip. I've seen a few tutorials on YouTube so far, but I wanted to post my take on it. Some of the tutorials used a bit of green in her smokey eye. I stuck with silvers/grays because that's what I saw in the pictures. 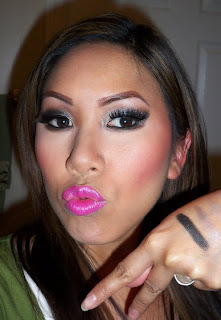 Click here to see the pics, my recreation of the look, and your chance to win! Happily, I was able to use my Sigma Makeup Beauty on the Go Kit in Smokey Eyes. I love killing two birds with one stone - getting to do a tutorial and review all in one. Since I didn't have a matte brown in the quad, I improvised by using my Styli Style liner from http://www.valentinekisses.com/ as a brown base. I think it's great to use liners as shadow bases and in the video I show you how to do it. Check out my previous review on the Sigma Neutral Shades Kit to see information on packaging and pricing since that didn't change. Like the Neutral Shades Kit, the colors are again pretty shimmery. There is one exception however, the Paint It Black Shade has a bit of shimmer to it but it's more of an intense velvet kind of shade. One of the most vibrant blacks i've tried! However, it's still very loose so watch for fall out. My next favorite shade is the dark silver called You Got the Silver which I used as my lid color in the tutorial. The other two shades are okay, just super shimmery. I would recommend using a matte highlight color with these shades to balance them out. 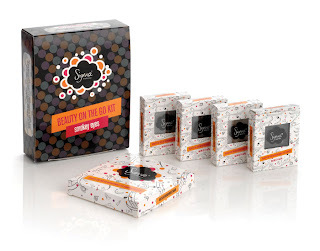 Sigma Makeup has again generously agreed to sponsor a Beauty on the Go Kit for one of you lucky readers. I will not be posting on Monday because I have it off :) Good luck and have a great weekend! FTC Disclosure: This product was provided by the company for review. I have not been paid to write this review and am not affiliated with this company. These are my honest thoughts. i would love love love to win this product! Then I could recreate your exact look cause it's absolutely gorgeous!!! i love lady gaga!!!!! i love her fashion statements and she doesn't care what people think of her. I've been trying to get more "smokey eyes" palletes, so this would be a great addition to my kit! hello the reson why i would wanna win it this is a great oppritunity to win some thing, and makeup is my passion i am starting a makeup/beauty channel so if i had more makeup i can show people the lady gaga look and tell them where i found this look from and its you. I love Lady Gaga's style and music talent! I would love to win this kit because the colors would look so amazing on my skin! I would love to win this because I just realized how much I love smokey eyes. It would be great to have a kit with all of the colors I need in one place. God luck all! Oh my...I love this look.I would love to win this palette.I love the colors in it.Love Lady Gaga,love her music huge fan.Also I would like to recreate this look.The video you posted is so much help especially with individuals who are learning to apply makeup...like myself.Thanks again for the tutorial. i would love to win because i want to own a palette from sigma. 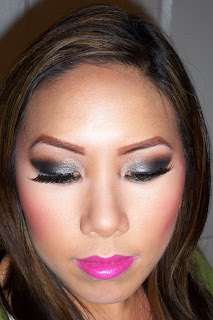 Id love to win this smokey eye palette you made a great look id love to remake it. thanksss. I would love to win because I've had flu for weeks and I'm feeling a bit sorry for myself. i would love to win because i have wanted to try out sigma makeup for over a year now and this palette looks gorgous. and also make some of my own. I would love to win because I haven't tried the Sigma makeup line yet but I've heard great things about it. I would really love to win because I am a huge fan of Sigma and I love this look! I would totally love to win because I'm a beginner makeup artist and really want to build my collection! I enjoy your tuts and I'm learning a whole lot! Thanks for this opportunity to win and wow I love SIGMA!!! Their makeup brushes are amazing and after I tried Indianwood I fell in love and knew I had to try the rest! I would really appreciate if I was your chosen winner! Plz plz plz pick me! Oh yeah of course Lady Gaga's awesome, but did I mention how much I love sigma! AAAH gotta have it! Would be sooooo grateful! I would love to win because that black looks amaaaaazing! I'd loveee to win because I love this look, and I love Sigma and the colours in that pallete. And oh my God, Lady Gaga just rocks. I would love to win, i never tried sigma so this would b great if i did win. I'd like to win because I love this look and would love to recreate it with the same products you use! Hi Ren! Beautiful look, as always! Please enter me! I'd love to have the perfect smokey eye kit and I hearat Sigma brushes! I do have the neutral shades and would love a chance to try this one!! My stay-at-home mom budget isn't allowing me to buy this and I would love to win something! Thanks! I tried to do a smokey look yesterday and I don't think I did it properly...can't wait to try your tut! Yay! would love to have this great palette! !the colors are amazing and beautifull.. I really love my Sigma brushes and am interested in trying out their shadows, but I'm on a no buy!! I would love to win the Beauty of the Go kit because the smokey eye is my favorite evening look. I would like to win the palette because I'm always on the go, and this is sooo portable and versatile. I'd like to win this beautiful smokey eye palette because I have just started to wear/buy makeup and my husband has cut me off since I've crazy spent already! :( Now I wish I started my kit with Sigma quads :( ABSOLUTELY BEAUTIFUL (checked out the website, such awesome colour combos) Good luck to whoever wins, and appreciate the opportunity! Thanks! got to win renrren to look hot like you!! I would LOVEEEE to win because its such a great palette to have! You can do so many looks with it and also, how can we forget how great sigma makeup is!! i would really like to win because i want to give this to my friend who cant really afford makeup. she would ADORE this! thanks! please consider this because you will be making someone REALLY HAPPY! I would love to win this quad, because I love sigma make up, I love this tutorial, and I don't have a good smokey quad. I need to get practice doing it, because I LOVE smokey eyes! :)Thanks! I would love love LOVE to win because i have loved lady gaga from the beginning before she was even hugely famous and have always wanted to recreate one of her looks but have never had the means. Thanks so much! I would love to win because the look looks so pretty on you and I'd love to try it myself. I would love to win because I love doing smokey eye looks and this palette has the perfect colors for a smokey look. i would really like to win this for my friend whose family is on a tight budget. she cant afford makeup, so i want to give this to her really badly. I have new Sigma brushes but was skeptikal about their makeup. 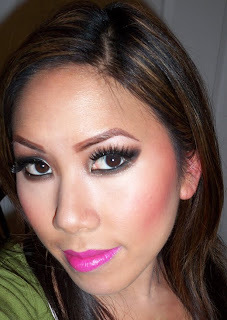 I would like to win the makeup so that I can tryit out with my new brush kit and this look would be prefect for me. I would love to win because love this look and would love to redo it for my birthday and would love to try the Sigma shadows. Thank! Id love to win because i"ve never tried any sigma products before! I would feel very privileged to win. I have never won a giveaway before in my entire life. The look is beautiful. I have a lot of respect for Lady Gaga. Shes an inspiration to all makeup artist, a muse. You are an inspiration too w/ the beautiful tutorials you do. Thank you. I've been reading your blog for about 8 months now but never had an account to 'follow' with, so I finally made one. I love makeup but am a super broke college student so am limited to more drugstore brands. I would LOVE the opportunity to try out another brand I would otherwise never have the opportunity to try. Plus I've never really done a smokey look and want to try to add it to my repertoire cause it seems like every girl should have it. I would love to win this because I haven't had the chance to try any sigma makeup products yet. I hope I win because I'd love to try out that palette. I love the sigma brushes so it would be nice if I could try them out on the eyeshadows! Hi Renren..I would like a chance at winning the quad. the look u created was really pretty and I'll like 2 try it. Thanks! Beautiful look. I would love to win and be able to try the Sigma line and also try out this look. It's so much easier to see someone do it and tell you what products they use. You do an awesome job. i would love to win this palette because I have never tried any products by sigma before. i also dont have any smokey eye kit in my makeup collection so this would be the perfect for me. i also love the lady gaga look you did, its the best out of all the beauty gurus done so far. I would love to win because I am broke right now,lol and because I am a makeup novice. I want to get into applying eye shadows to take it to the next level! My youtube name is "bobfryfish"
Beautiful look! Love the makeup! Lovely look. i would rEALLY REALLY like to win for my friend who cant afford makeup at all. if you pick me, ill be the happiest person in the world! and so will be my friend! I would love to win because as a mother of 2 kids under 3 it is hard to buy some of the higher end makeup. I would love to Win The Sigma Makeup Because, My Dream is to become a makeup Artist But since i am 15 years old I don't have any money & I can't get a job So its Rare when i get money. And my parents are very tight on money Since my dad is starting his own business. So it would be So wonderful & a Great help if i won. But if i don't i know That The Prize will go to someone who needs it more then me <3 You are my makeup Icon & Always will be. I would love to have some sigma in my makeup collection i keep hearing amazing reviews one after the other! Im loving the colors aswell.. I would love to win because I don't own any sigma make-up, I <3 smokey eyes, I think they're so pretty, and I know the colors in this palette are too!!!!!! 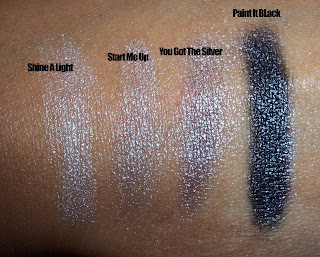 I would love to have this quad from Sigma because, like you said everyone can benefit from a smoky eye. it looks good on everyone. I follow you on you tube and just recently on your blog. Great look and great video. I would like to win because the colors on the pallete are absolutely gorgeous and I have yet to own a set of colors like the ones shown. I love the look you created with it too. Love Gaga, she is so unique in a cute way...I would love to win so I could try out some items from Sigma line. Id love to win this! you have no idea i want to try sigma makeup! thanks. I am loving the colors and id love to be able to remake the look you did! i <33 lady gaga and her makeup looks you never know shell do next. I would love to win because I love Sigma, and this Lady GaGa look :D I would like to try it out! I would love to win because I love Lady Gaga and I love this look! Hey! thanks for the giveaway. I want to win this kit because I am loving the silver smokey eye and want to try creating the same look. thanks! Entry #3: I would love to be able to review these products and write about them on my blog. Whenever I come across a product I love, I like to share it with others. I love the look you created of Lady GaGa. I would love to win because I'm new to Sigma and would love to own all their product. I just bought the travel brush set and slowly building. i would love to win and try out this makeup line!thanks ren! I would love to win so I can try out something new!!! I would love to win because I have finally learned how to do a smokey eye, and now I need some different shades to pull it off. You did an amazing look, and now I just have to do it. this is a great tutorial...I think it look better than Lady Gaga. hae hee. Umm....I would love to win, b/c I have not done a good smokey eye, since my eyeshadow is very cheap, so it is not pigmented. I love this pallete so much. I really want to try it. I would love to win because for me lady gaga represents freedom for me. She embodies what being true to yourself is all about, she doesn't conform to what everyone else's thoughts or views on what fashion but she does her own thing with such confidence which is trully inspiring. That being said like you said in your video every girl should have a smokey eye quad in her kit, well i don't have one so this would be perfect for me. I would like to win because I don't own any colours for a smokey eye D: I know, it's sad really. Those colours are so pretty too. I would love to win because I love Sigma brushes and I really want to try their make-up and this kit looks amaayyzing and it would totally make my year if i won =) Thanks so much Ren! I would love to win these shadows so I could put your tutorial to good use. I would love to win that kit because Sigma has amazing products, and that look you re-created was awesome. Definitely have to try it! Thanks, Ren! Lada Gag looked so good and I was admiring her makeup to find your tutorial on it was amazing, so good I wil fave it and make sure I can try it out. I disagree that he blondeness was better for the look though, I think the rich brown of your hair and eyes truly complement those shades. Paint it black is divine. Please can you add me to the draw, i would love to win, if not I have to get that kit. Very interested in the primer too. You did a great job recreating the Lady Gaga look at the Grammy's. I would also love to win the Beauty on the Go kit because Lady Gaga is a fashion and idol inspiration to many out there including myself. I have never tried Sigma's brand before and would love to win so I could recreate her look or just to see how great the makeup is. Thank you for your inspiration. I would love to win because I just discovered your blog about a month ago. I am an aspiring makeup artist and I tried to break into the industry but because of life and school I had to give it up. Reading your blog has inspired me to get back into the game. You make techniques very easy to learn and your tutorials are awesome. In everything we do there are role models and you are mine within in the makeup game. I also love love love lady gaga. I run to her music in the gym and I also find myself defending her uniqueness. Being able to recreate her look would be awesome!! Please choose me! i've never tried any sigma products before so if i get chosen, it'll be my first time using sigma products. i'll be super excited if i get chosen and if i like it, i will definitely promote the product and will continue using it. thanks a bunch ren ren. i would really like to win because ive never won anything in my life, and i have never owned a makeup palette before. thanks! For me, I love shimmery Es. It is just amazing how shimmery and pigmented these ESs are. I love love the palete and their packaging. Also I would want to win this because I can do smokey eyes for future events on my cousins and sister. but id love to try and win the eyeshadow stuff... who doesnt love smokey essentials? I am already subscribed via youtube and google, user name JanineKarina on youtube. I would love to win b/c I am a big fan of Sigma & Lady Gaga! Well now I'm just dying to be able to follow along with the tutorial! I would love to win because I hear so many good things about Sigma products but I am a teacher and I don't have the money to buy the products right now. I would love to win because Lady Gaga is from my hometown of Yonkers and I have to support my Yonkers girl by recreating this fab look lol. How are you going to possibly pick a winner? Sheesh! Such a huge response! I would really like to have this palette! To use on clients or myself! I totally love it and would really like to have it! No money right now to get it on my own, but will definitely get the complete set when I do! Thanks a bunch for this opportunity to win such a great prize and keep doing ya thing! Much success to you! I haven't left a comment in a while, but I actually really like this look. I didn't really pay much attention to it when Lady Gaga rocked it, but you definately rock it really well also! I'm actually going to try this out but with purple and silver instead of black! I havent been branching out that much yet! And it would be awesome to win the sigma e/s quad, so my roommate can have to new eyeshadows to use! Hey RenRen I truly enjoy your makeup vids and learn a lot of new terms of makeup and a lot of wonderful looks...I would love to win this quad to add to my collection and have something that this to help others with makeup too....i like lady gaga she is cool....thanks RenRen for the great info and makeup tips your awesome!!!! I would like to win :) I dont own any sigma makeup. I would like to win only because I have heard such great reviews about the sigma makeup, but don't own any! I'm also a HUGE fan of Lady Gaga and this would remind me of the look you recreated from her using this palette. I would love to win because I would like to recreate this look. Lady Gaga is such an inspiration to me because she is herself and takes no remorse for it. Thanks. Awesome palette! Thanks for another great giveaway! I would love to win this... still haven't perfected the smokey eye look for myself just yet, and I would love a chance to use what you use in your tutorials to recreate the look! I would love to win because this quad just looks gorgeous! I loved the look you did with these colors! i really want to try sigmaaa! Pleaase id love to have this palette. Great colors! I <33 Sigmaa! Id really love to be able to try this palette. Great colors, great company, & you used it to make a great look. I'd Like to win because I think this is a great pallete with great colors! would lovee to have a product by sigma..
i WOULD seriously LOVE to WIN this PALLETTE because I haven't PURCHASED a PRODUCT from SIGMA yet. THIS would BE my CHANCE to TRY a PRODUCT to GET to KNOW their PRODUCT. i've HEARD great THINGS about THEIR line. THANKS for THE opportunity!!!!! CHOW! I would love to win because I'm really impressed with the pigmentation of this palette! Again i would love this palette! I want to sobadly have some sigma poroducts! I would love to win because I just love Lady GaGa and makeup! I would love to win thissigma palette great colors and you used it to make a great look. love it. i want to win this paletteso badly i really want something from sigma its great! Such a great palette! neutrals, but so NOT bland and boring! i could totally use this! i would like to win because ive never won anything in a contest before, and i have never tried sigma products. I would love to win this kit! I have heard so many great things about Sigma Makeup. My hubby just bought me a brush set for Valentines day! I would love to try their makeup! Thanks for having this contest!